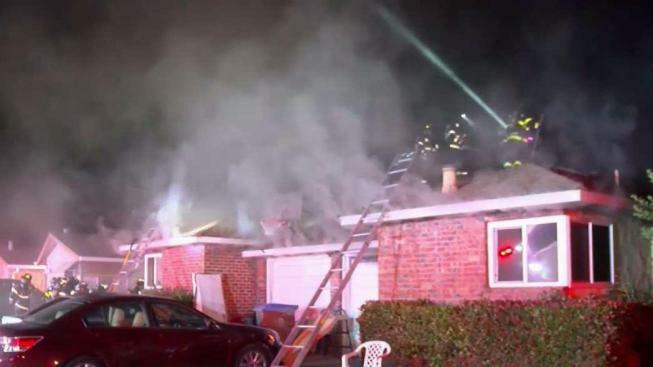 Two people were transported to the hospital and one dog died after a blaze broke out at a duplex in San Jose early Wednesday, according to fire officials. Kris Sanchez reports. Two people were transported to the hospital and one dog died after a blaze broke out at a duplex in San Jose early Wednesday, according to fire officials. The blaze was reported around 12:10 a.m. along the 500 block of Hazel Dell Way, according to San Jose Fire Department Capt. Brad Cloutier. Responding firefighters found dark smoke pouring out of the attic and one of the windows of the duplex, Cloutier said. Three people managed to escape the blaze, but two of them had to be transported because they were both suffering from smoke inhalation and one had a slight burn injury, according to Cloutier. "They woke up to the sound of fire and crackling and there was heavy smoke in the apartment at the time they woke up," Cloutier said. "They actually escaped through a bedroom window." Fire crews knocked down the fire in about 15 minutes, Cloutier said.